Last week about to start! 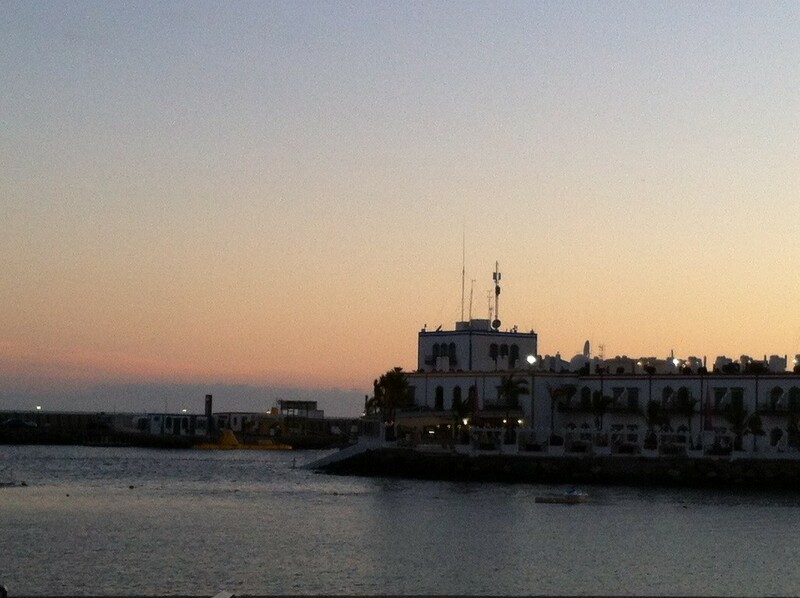 I am so happy to be able to say that my days are ending in Tenerife! Only ten more days and I can once again walk on the sweet (and ice cold) grounds of Finland. I have been a little bit ill this week, I had fever and lost my voice. Or atleast I think I had fever, I couldn’t be sure because nobody in here owns a thermometer. I wasn’t working on Monday night or Tuesday. Now I’m slowly starting to feel better and I’m getting my voice back. Tomorrow when I go back to work, I wont be going to the Miniclub anymore. I sort of got kicked out of there because one girl run away from the club to the pool without me. Her dad got angry to us and you can only imagine how proud Choco was of me. I had 6 children in the Club at the time, and I just simply couldn’t handle all of them, especially when the children tend not to listen to a word I say. Anyway, my last week will be at the pool area with the other Animación team members. Which by the way includes two finnish girls ! They are called Miia and Juulia, and they’re from Vaasa. They are staying here for seven weeks. I think this is all for now. I might still write one post from here before I go home. So, I have been here now for five weeks, and three more to go! I have started to get along pretty well with my coworkers, even though they keep constantly changing. Even my dear mood changing boss Choco has been nicer to me, sharing kisses and hugs to me whenever we meet. Quite a change from looking to the other direction when I came to his direction…I’m not still complaining, gotta enjoy it while it lasts, right? 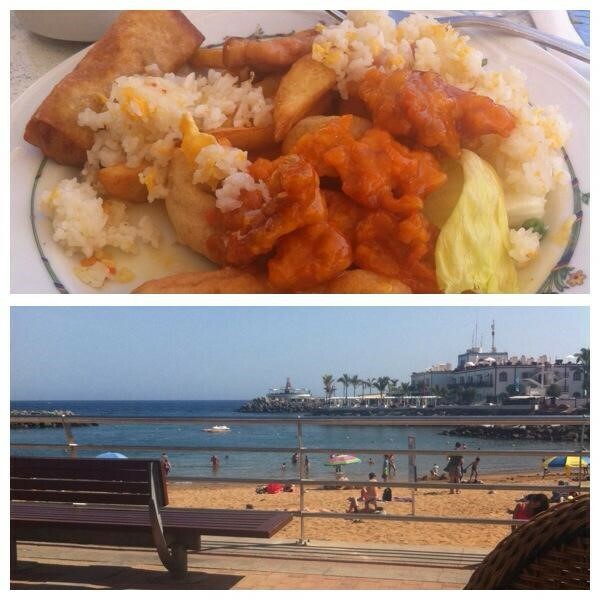 I have already been in Tenerife for 4 weeks, and I’ve got another four to go. I am officially 50% done with my training! Although I think I have lots of paperwork to do after I come home, but you get the point. After the struggles in the beginning, everything has started to work little better. After three weeks of working, I got my first work schedule, where I can see my day offs. I still don’t know all of the stuff around here, but I do my best to learn. 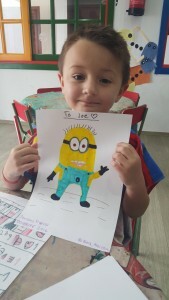 I have been working mostly in the kids club where I draw and play with the kids. In the evenings I go to the Mini disco and sometimes I dance in the disco with the kids. If I don’t dance, I assemble the medals and gather the diplomas for the days winners. After that I usually just stand around and look if anybody needs my help with something. If nobody needs me, I can leave to my room at 10 o’clock. I don’t think there is anything else to tell you, every day is like the previous one and like the one tomorrow. I have now stayed in Tenerife for 7 days. I arrived on Tuesday afternoon. I started working on Wednesday with the Animación team at the pool. We play different games with people of all ages. We also do “water gym” and other activities. On Thursday morning I went to the other side of the island with Eva to get my NIE-number. We went to the police station around 8 am and waited in a line for an hour. Once we got inside I got a time for my appointment, and it was at 11.30… So me and my coworker went to get some coffee and went to the bank to pay my NIE. My name is Nea. 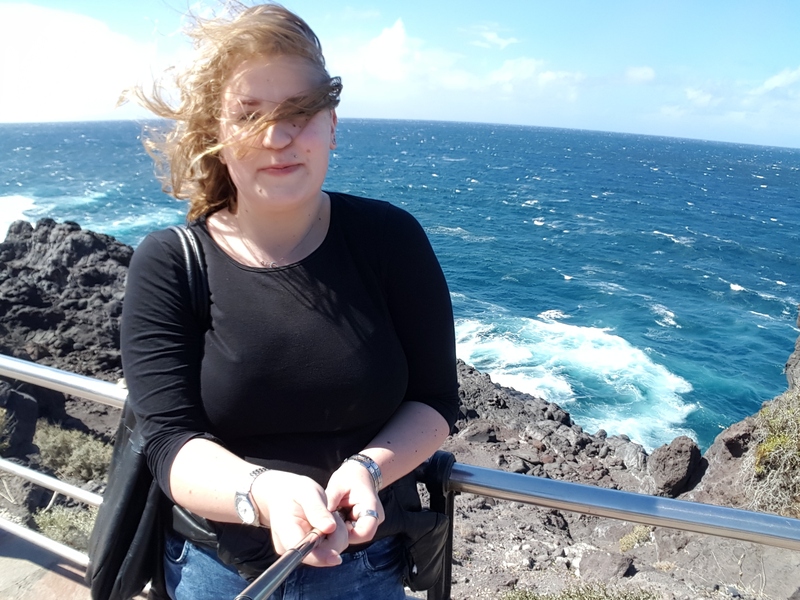 I am a last year tourism student at Jämsä Vocational School and I’m leaving in February to Tenerife to study abroad. In this post I will introduce to you little bit of the island of Tenerife, and also the hotel that I’m going, which is Globales Tamaimo Tropical ! So, shall we get started ? Tenerife is the largest island of the seven Canary Islands, it is also the most populated island of Spain, with a land area of 2,034.38 square kilometers and about 898,680 inhabitants, which is 43% of the total population of the Canary Islands. About five million tourists visit Tenerife each year, it is the most of any of the Canary Islands. It is also one of the most important tourist destinations in Spain. Tenerife has two airports, Tenerife North Airport and Tenerife South Airport. And then something about the hotel itself ! 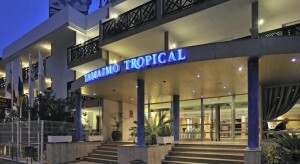 The Globales Tamaimo Tropical Hotel is made up of 372 comfortable apartments and is located in Puerto Santiago in Tenerife between Los Gigantes and the lovely beach known of Playa de la Arena. At the Globales Tamaimo Tropical Hotel there is a variety of accommodation to choose from such as comfortable studio apartments, large one-bedroom apartments or two-bedroom apartments – ideal for family holidays. Within the holiday complex there are spacious and peaceful solariums with free sun-lounger service for you to relax in or you can take a refreshing dip in one of the 5 swimming pools (2 adult, 2 kids and 1 heated). For an unforgettable holiday in the sun, entertainment is available for both adults and children from 11:00am to 11:00pm when the disco bar comes to life with with professional night shows. I made my last and fourth internship from school in a beautiful old hotel Reina Cristina in the city of Algeciras, located in south Spain. I was working in the reception from February 11th until the middle of May. In hotel Reina Cristina they have about 180 rooms, in three floors with different views. 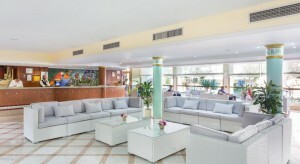 There is also inside and outside pools, lobby -and pool bar and also two conference rooms. The whole hotel area is one big garden and its a great area to organize for example weddings. 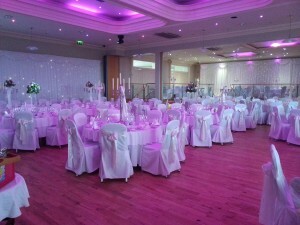 We had many weddings and other celebrations. When I got this place for my internship, I thought long time that I was going to leave to city called Cadiz, cause Algeciras is a part of province of Cadiz and in the address of hotel I saw just Cadiz. Just some weeks before I left to Spain I was looking the map more specifically and noticed that I am leaving to city called Algeciras. Started to find information from internet about the city but I didnt find much. When I got there, the city didnt seem too much living but with more time I started to like it. Is very different city that I have never been with harbor and not a lot of tourism. The tourism in Algeciras is based on people who stay there for maybe one night before they take a ferry to Morocco. From Algeciras you cant move easily to other places, Gibraltar is very close its opposite of a port of Algeciras and you can see the rock all the time. Also in Algeciras there is good bus and train connections for example Cadiz, Sevilla, Ronda, Tarifa, Marbella, Malaga..
Algeciras is very near to Africa and its very easy to get there, you just go the port of Tarifa and take a ferry from there and it arrives to Morocco in one hour. I liked the nature of Algeciras and the big moutains that surrounded the area. When I arrived to Malaga in February, Julie from the hotel was there and picked me up and we left driving to Algeciras, by car it took about 1,5 hour. Arrived to the hotel, and next day we left to get NIE number for me so I can start working. We went to couple offices and bank to register my informations and I got the number. Same day I started working. 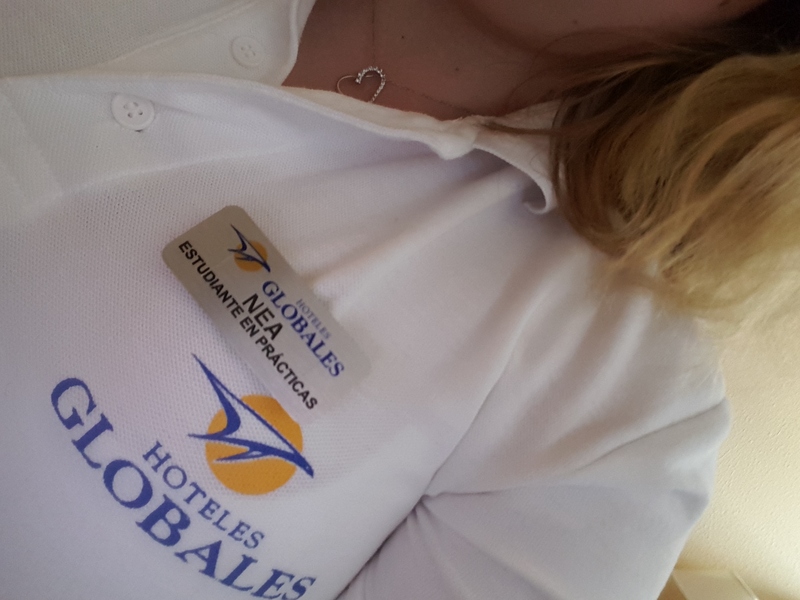 My working clothes was a skirt, shirt, jacket and a tie with the logo of the company Hoteles Globales. I was working always in the morning or in the afternoon, I didnt have night shifts. Morning shift was from 8-16 and afternoon from 14-22. The first month I lived in very small room at the hotel, but after one month I just didnt fit in anymore with all of my property so I changed to one bigger room at the hotel. At work everything went well, I didnt have any big issues. Couple of times in the start was hard situations with the local clients if I didnt understand their Spanish good and they didnt speak English. But later I started understood what they wanted and was able to serve with them too. Some of the local clients was reacted friendly and sympathetically when I told I speak little bit Spanish, but some of them was surprised and wondered how is possible that I work in the reception and not speaking perfectly Spanish, which I totally understood. Most of the clients at the hotel were from UK or from Spain. After them there were clients from Germany, Portugal, Italy, USA and Scandinavians. Clients from Finland I met maybe 5-6 times. Most of the clients were people that have already retired and was looking for a beautiful nice and quiet place for relax at their holidays. 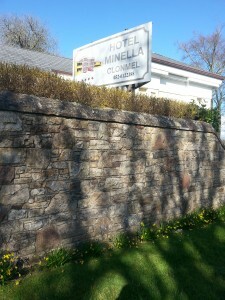 In the end of April the hotel was totally full, we had a teams playing handball at the hotel. Kids were ages 8-16. 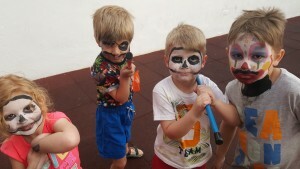 At that time we get many appeals cause the kids were very noisy in the rooms and all the areas of the hotel. Those times we called the mechanic working in the hotel to go and tell them to be more quiet.. In the hotel we had also many loyalty customers that keeps coming to the hotel couple of times in a year, year after year. They love the style of Reina Cristina and like to visit Gibraltar often cause its near. From this internship I learned of course the Spanish culture and to understand how are Spanish people. Also some Spanish language which will be helpful in the future travelling there. Of course was developing my English too and I got a lot of compliments of it which was very nice. Here is a link to one video that is telling about the city of Algeciras, and in time 3 minutes there is filmed the hotel I was. There is Sara, the event producer and Francisco, the Manager of the hotel and they are telling that the hotel is oldest in Costa Del Sol and that in Algeciras there is very old and relevant railway station. Also in the video you can see the nature that I was talking about before. Just before 3 minutes in the video, there is a part where the girl is telling that from there you can see Morocco, Ceuta and Gibraltar! From the video (time before 1 minute) you can also see some parts about Paco de Lucia. He was one of the most significant flamenco guitarist of all time, he is from Algeciras and people are very proud of him. He died of February 2014 and in the city you can see memorial things for him. When was gone one year of his death, there was a huge memorial event in the centre. The sister of Paco de Lucia was staying in Reina Cristina with her family at that time. They are filming also the port of Algeciras, which is getting bigger and bigger. Weather was most of the time like this, sunshine and a little wind, just perfect!I was waiting for it a looong time. We were supposed to go already in autumn 2014 but it was too late to start all that paper work so we decided with Johanna that we want to go on spring there. It was good decision because there wasn’t so hot as I think at the autumn would’ve been. It was warm yes. It was just right tempature. There was raining about two times in 2 months! I’m jealous! So when we did get there they welcomed us warmly! We were both ill, snig fly and my voice was so down it sounded like males voice 😀 that was pretty awkward!! After finally we get to our apartment, after visiting Spar(-market) we went to sleep and slept over 17 hours straight ;D Our work was supposed to start 12.6 so we had almost week like a vacation. I started my first workday alone at 9… It was scary but somehow I was part of group already when Johanna came to work at 13.. They were so nice and kind for us and they were excellent teachers! So patient.. Customer service,when client came to reseption I asked can I help, if i could help, I did what I could and if not I asked to wait a moment and asked for somebody else to help the client. Room keycards didnt always worked so I needed to proces them again. I did that many times at the day. I explained to client whats wrong with it. I made the carton papers which included; name, arrival and departure dates, wifi-code, paper where was everything about the restaurant timetables and cleaning services, snack bars times and everything about the hotel. Sometimes the lady from the Spa called to reception that they need someone to look after the Spa reception when she goes to eat. So me or Jossu went to there to sit like half an hour or one hour. There wasnt customers much, only couple times someone came out of the gym and I needed to take 2 euros and one time a lady wanted to do a massage order. Next to the Mogan Valle was hotel named Mogan Playa. There was a nice girl as a trainee, about my age. Her name is Elena and she is from Germany. We got to know each others because she lived at the apartment near by us and she was always in the same bus-stop. She speak very good spanish and she wanted to help us with the police station because polices doesnt speak english in there. At least that much that we could got our NIE numbers. (By the way, we got our NIEs last week there ;D But we also got money last day because they had some problems with that. I dont know but it doesnt matter anymore. 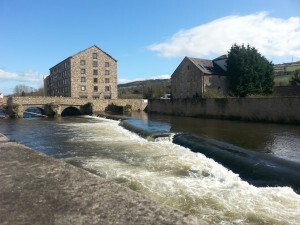 Weather was most of the time like this, sunshine and a little wind, just perfect! At night the weather was colder but the view was fantastic! Definitely more english. I learned that it doesnt matter if I cant say/spell it perfectly like people who speak it as mother language. People do understand me. I learned that whatever I am gonna work, I will not be a receptionist. Theres nothing bad to say about that job, but I just feel inside that it is not my job. Theres something what doesnt work for me. I learned a littlepit spanish. Example: Hola! Que tal? Muy bien, tú? Gracias! De nada! Lo siento, no habla español. Puedo ir a comer? Sí, No… I think I did good job there. Of course I have to do always better and better but when we know that this was my first time job where my collegas does not speak same language, and I am far away from home etc., I really did what I could. I just need to do and do and do more and more that I give 100% of myself f work. We started our little trip on 2nd of March. We spent a week in Helsinki at our friends place. At 6th was our flight. 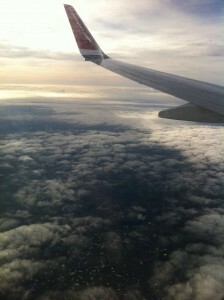 Our flight was from Helsinki to London, and from London to Las Palmas. 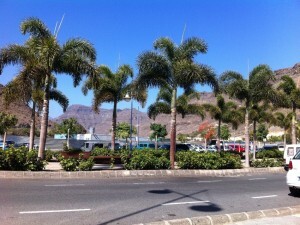 When we arrived in Las Palmas, we took a bus, first to the Playa de Cura and from there to Puerto de Mogan. Actually i was kinda suprised about the cheap prices of buses. I think it was about 6 or 7 euros or something. After we arrived to Puerto de Mogan we went straight to the our hotel. There we met our colleague Fernando who told us how we get to our place. It was kinda complicated, because they didn’t have the correct adress. But finally they called us a taxi and we finally got there. So, that was our first night in Gran Canaria. On our second day, we slept very late. Then we went to look around our new hometown. 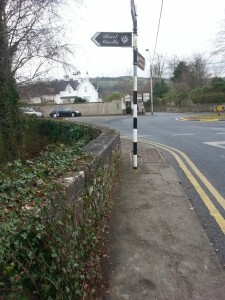 Actually our biggest problem on first week was to find a bus stop. On our last week we were wondering that how was it so hard to find in a small village like Mogan. But in few days everything realy went okay. We had a one week holiday before we started to work. That week went really fast! Mostly at the beach and just wondering around. My first day at work was from 1pm to 9pm and it went really fast. I don’t remember much about it, but they really didn’t let us do anything on our first day so it was mostly just watching what they were doing. On our first week we learned to make keycards, check ins and check outs. And we also learned some spanish words too. Sometimes working there was really stressy. Atleast when there was only spanish guests, but i think it was a good way to learn to handle stress. Mostly there was guests from German, Norway and England. I really liked our colleagues. There was Irene from Norway, Simona, Heike, Marina, Linda, Fernando, Silva and Octavio. They were really nice and friendly. And also patient. Of course they helped us in everything we needed, but they also wanted to make us feel comfortable and that we are welcome there. I also made one check-in al by myself and i think it was really scary because there is so much what we need to know and remember but it went quite ok. This is the picture of our flight to London. There was some “not so nice things” in our hotel too. For example there was two hotel manager, Marina and Heike. And there was some problems with the communication. One day i asked Marina that can i leave litte earlier because there was nothing to do. And i also told her that i can come some other day when there is more arrivals. She told me that i have to come on saturday. On saturday when i went to the hotel, Heike said that i don’t have to work and that i should go to the beach or something. Next day Marina asked me why i didn’t come to work on saturday so i told her that Heike said i don’t have to. And i think she got little upset about it. But other than that everything went quite okay and we started to open up and even relax a little bit. On our last week at work, Silva told me that we shoud try to talk only spanish. It was really scary but fun. Our job at the hotel was basically help others. We did the keycards, check ins, check-outs and helped them with the drinks and stuff like that. There was never a boring day and everyday was different and we learned something new. I think i did pretty good, but there is still lot more to learn. 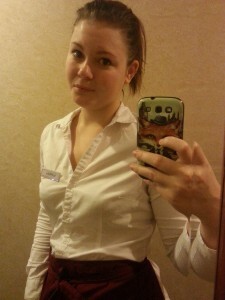 Are colleagues told me that im very good with customers because im social and very open person. And i also think that the customers liked me too because of that. I also wanted to make customers feel themselfes comfortable so i tried to talk with them as much as possible. For example i asked them that “how’s your day been?”. But im also really impatient sometimes. When something doesn’t happen right now, i get frustrated and lost my nerve. But what comes to professional ethics, everything went okay. I followed the rules fine and they never had to tell me that i have done something wrong. But there is pretty much everything that i can tell you. I hope that this report is okay to you. I don’t know if there’s enough text. Täällä on nyt vietetty reilut neljä viikkoa. Tuntuu paljon pidemmältä ajalta! Oon hyvin päässy töiden pariin ja oppinutkin jotain tekemään 😀 On tää välillä aika raskasta kun pitää työkavereiden kanssa puhutaan vaan englantia ja espanjaa pitäs samalla oppia. Suosittelen kaikille ketkä haluaa espanjaan työssäoppimaan niin opettele ensin espanjankieltä! Paljon helpommalla pääset kun osaat sitä ennen tänne tuloa, nää on aika vaativia sen suhteen ja tosi monet sanonu että “sun TÄYTYY oppia espanjaa”, tulee vähän semmonen pieni stressinpoikanen et ootas nyt, emmä päivässä sitä opi 😀 Ei siinä, kaikki on muuten tosi mukavia ja avoimia ihmisiä, työkaverit ja muu hotellin henkilökunta. Meijän asunto on n.15 minuutin bussimatkan päässä tästä hotellilta. Bussiyhteydet on hyvät, koskaan ei tarvii odottaa liian kauaa. Asunto on sinällään ok, mitä nyt varmastikin jotain kosteusvauriota saattaapi olla kun pyykit ei meinaa kuivua.. Ötököitäkin on löytyny, semmosia iiisoja kovakuoriaisia jolla on pitkät jalat ja sarvet, ja valkosia lyhyitä matoja.. No, niistä selvittiin/selvitään, kunhan ne ei sänkyyn tule. Se ois viimenen niitti!